What is the Impact of Prenuptial Agreements on Child Support? Marriage is a beautiful institution which has existed over thousands of years in various forms, uniting two people in both body and spirit. Marriage ceremonies often involve declarations of eternal love and companionship. But unfortunately, not all marriages last forever. Keeping in mind the constantly increasing divorce rate, many couples tend to sign a prenuptial agreement. This agreement includes details regarding how the couple would handle their affairs, divide their assets in case they decide to part ways and file for divorce. But there are certain limitations to what you can or cannot add into a prenuptial agreement. However, a prenuptial agreement cannot include provisions regarding child support as the courts have the final say on that topic. 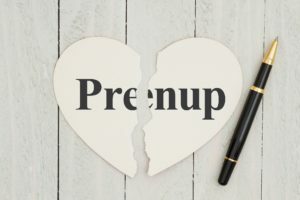 Can your ex-spouse use a prenuptial agreement to waive their child support? No. Even if you had agreed earlier to waive child support in your prenuptial agreement, the court will not deem it legally binding. Only matters in which a prenuptial agreement is most effective is in the division of assets where personal and marital assets are identified and separated. Therefore, if your ex-spouse attempts to avoid paying child support using the prenuptial agreement, you can approach the court. The court, keeping the child’s best interests in view, will calculate the amount of child support that either parent can and must pay. Only the court’s order and instructions will be legally binding. While in most cases, it’s the court’s discretion to decide and calculate the amount of money to be paid in lieu of child support, there are certain formulas which are used as well. From the Melson formula to the income based model, there are several parameters which the court takes into account while calculating child support. If in case, a prenuptial agreement includes the division or any form of calculation regarding child support, that too will not be considered. Only the court has the power and autonomy to decide and calculate child support payments. It is imperative that you hire a reputable family or divorce lawyer to ensure that your ex-spouse or their lawyer does not get any unfair advantage over you and to make sure that child support is calculated in a fair and just manner. In order to get more information about child support or to schedule a free consultation with an experienced child support lawyer, contact the Law Office of Fedor Kozlov at 847 241 1299.